How would you feel if your mom took a new job and all of a sudden your summer changed? How would you feel if you found yourself at a strange dilapidated mansion populated by a few eccentric artists? You’ve got lots of questions, but you get no answers. You know Grampa Mac, back in Milwaukee, is angry about it. You know that your mom isn’t telling you the whole truth. And Viktor, the guy driving the truck out from the train station, is less than friendly – he’s almost creepy in fact. That’s how Raine’s summer begin – with one added twist, no talking at all until dinner six days a week, no electronics either. Fortunately Raine and her mom arrive on a talking day. Raine meets the artists: a confused elderly poetess, Lillian, a severe reclusive writer Eleanor, a vibrant joyous fabric artist, Josie and an optimistic collector mosaic artist, Diego. She learns about Sparrow Road, Sorrow Lake, and the orphanage that once stood there. But what’s a 12-year old supposed to do with her days, with her summer? “What if?” I asked. “What was? Or what could be?” Diego makd the silence sound enchanted. Not a rule, but a chance. There are dreams for Raine and challenges and mysteries. There are joys and grave sorrows. There are choices and changes. What if? What was? What could be? 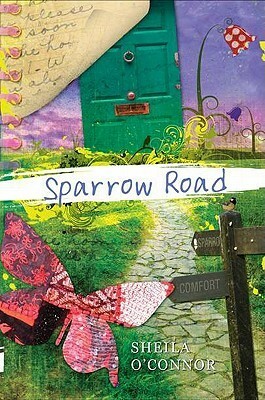 Go to Sparrow Road to find out. You’ll be glad you did.